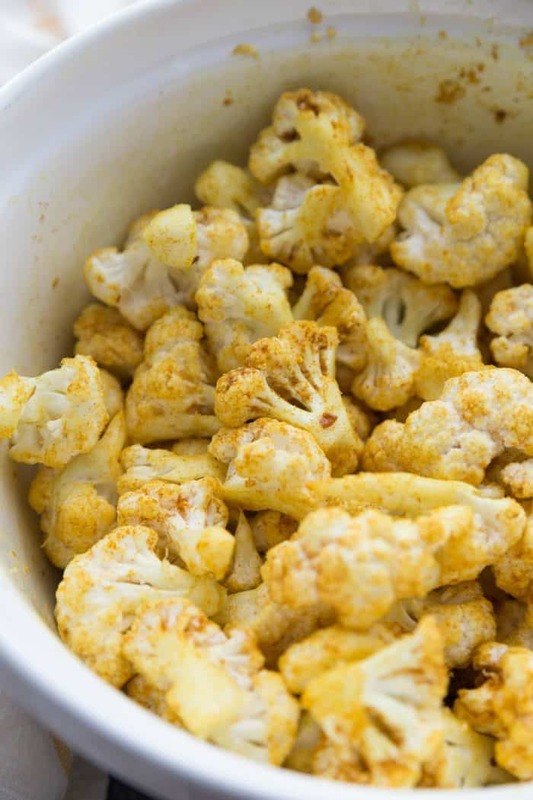 For the perfect snack, enjoy Skinnytaste’s Turmeric-Roasted Cauliflower. Also delicious served as a healthy side dish or with your favorite dipping sauce! WATCH THE VIDEO! 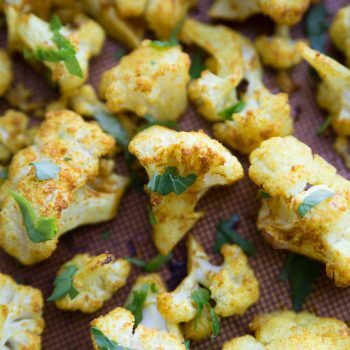 Friends, for those of you who love a healthy snack, my friend, Gina (Skinnytaste.com), knows how to get the most flavor out of every ingredient. 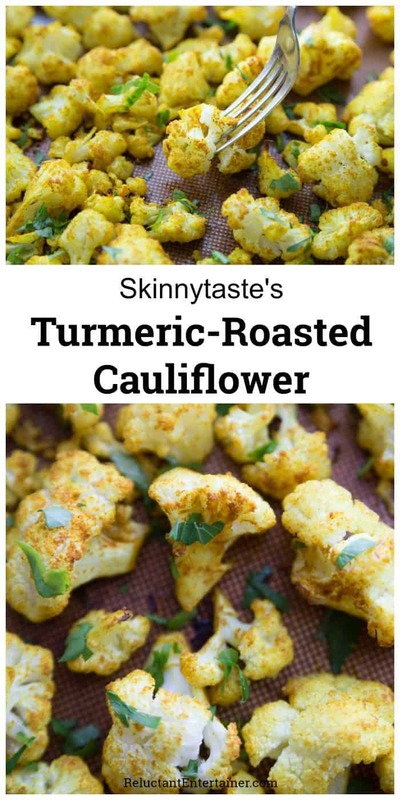 Like she did in this Skinnytaste’s Turmeric-Roasted Cauliflower dish, adding some great flavor to cauliflower for a healthy appetizer or side dish. Now that it’s fall, we love to cook dishes that are casual and easy … and good. You know, the kind that encouarge people to linger and talk around the table longer. 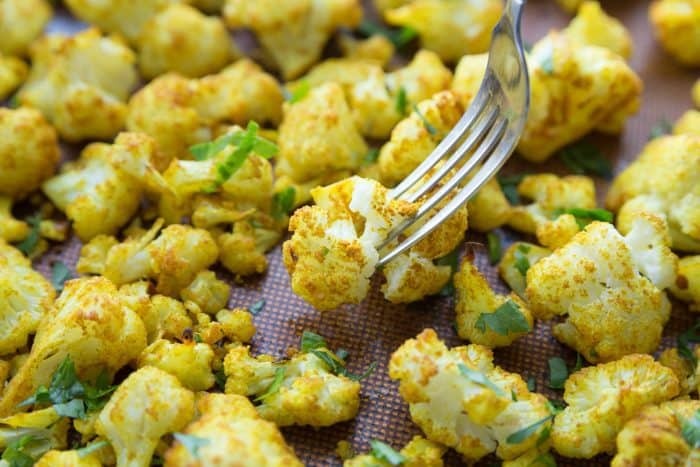 Start with cauliflower, and change it up for every season! 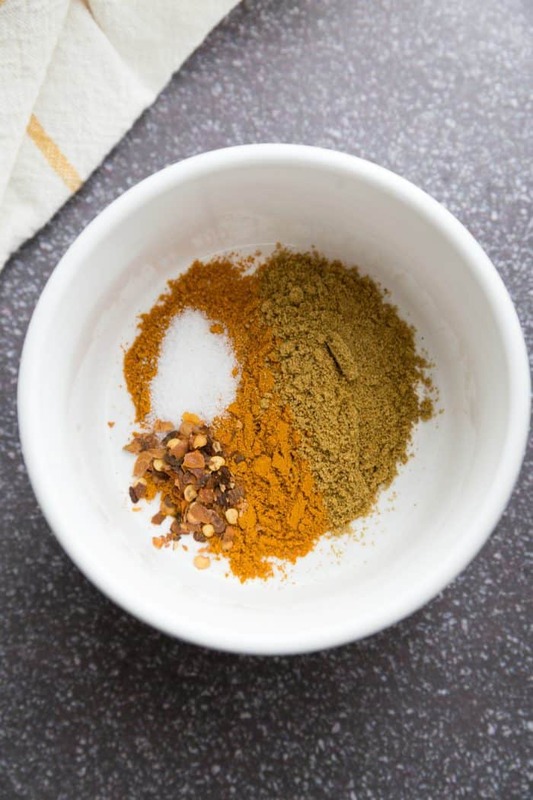 For fall, we’re using turmeric, which is a hearty, delicous flavor. Last week I made this delicious chicken dish (yes, with grapes and Brussels sprouts), with Gina’s Turmeric-Roasted Cauliflower. Everyone oohed and aaahed over the cauliflower! So good! I’ll be in Ithaca, New York this next week with Gina, so follow along on my Instagram stories! We’re going glamping, and I’ve never been glamping before (have you?) Check out Fire Light Camps! Gina’s brand new cookbook is out, Skinnytaste One & Done, and we’re going to be celebrating this already NY Bestseller! GO, Gina! In the meantime, this recipe … you have to make it. And enjoy this weekend with your family or friends! Preheat the oven to 450°F. 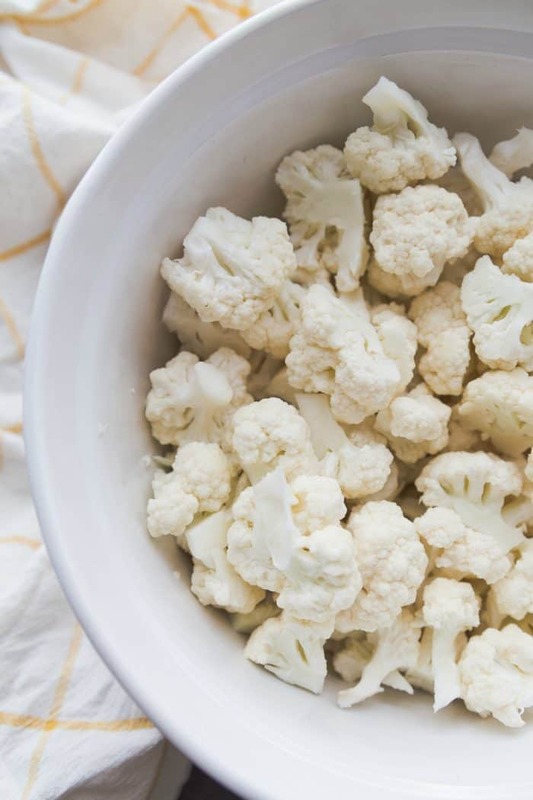 Cut the cauliflower florets into 1-inch pieces and combine with the garlic in a large bowl. Drizzle with the olive oil and toss to coat. 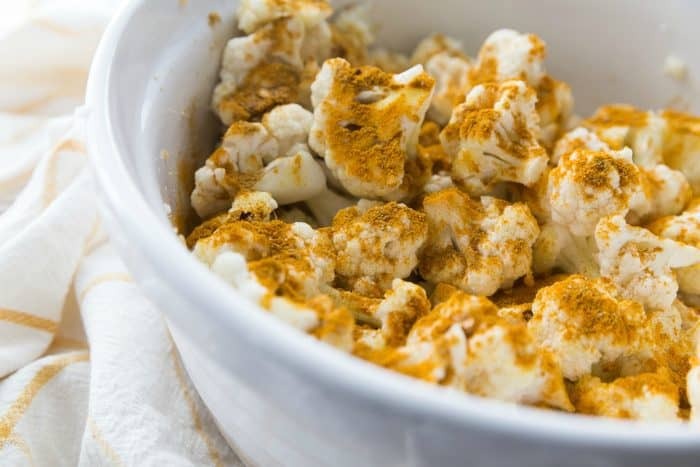 In a small bowl, combine the turmeric, cumin, pepper flakes, and salt. Sprinkle over the cauliflower and toss to coat. 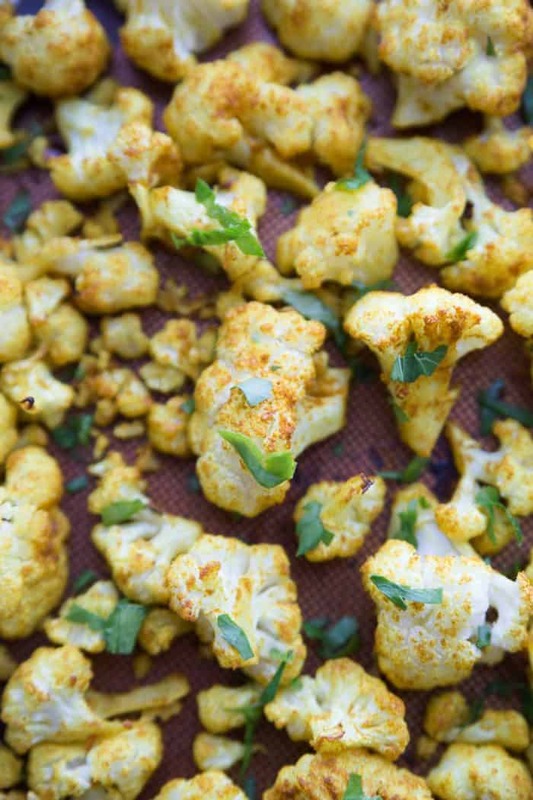 Spread the cauliflower out on a large rimmed baking sheet. Bake, stirring occasionally, until browned on the edges and tender, 23-27 minutes. 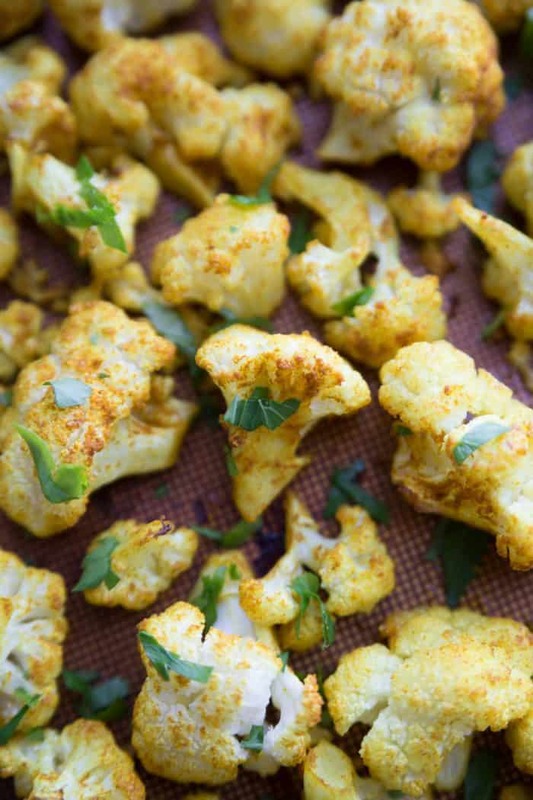 Remove the from oven, sprinkle with cilantro, and serve hot! This is update from 2015. This post has affiliate links. Every purchase from these links supports RE at no extra cost to you. Thank you!